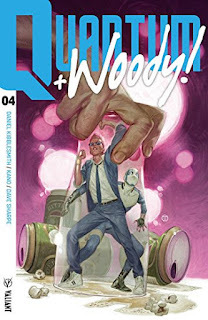 Balancing humor and action is a difficult trick to manage, but the Quantum & Woody comic manages it with amazing calm. The two - well, you can't call them heroes - are linked by the zero-point energy that gives Quantum his powers. Once a day, they must strike their wristbands, or else the energy will destroy them both. But Woody may have a solution - a genius in Australia claims he can cure them both. Sounds like a trap, doesn't it? It's a fun issue, with a few twists and turns along the way, and quite a few laughs.